Except in the case of The Butterfly Boy, the cover reveals more about the author and indeed the motivations for the book, than perhaps than most others. For instead of an abstract image commissioned by the publisher and executed by an artist, Tony Klinger has gone for a striking photograph of his grandson, Archie Hatfull, a nine year old boy from Norfolk. This is interesting and perhaps relevant at two levels; firstly it is a sign that Tony is interested in the art of photography. Understatement. Secondly it is indicative of the personal passion that has not only gone into producing the author’s first novel, but also suggests that there may be a tangible family connection in what ought to be a work of complete fiction. As you delve deeper into The Butterfly Boy (and if you are lucky enough to have met the author a several times, as I have), you realise that this book is as much Tony’s take on history – and a reminder to us all ‘never to forget’, as it is an interesting and engaging work of fiction. The characters are fictional as undoubtedly is 99% of the plot and the dialogue. The themes, as you will see for yourself, are dead real. What makes all this hang together and stand out as an unusually thought-provoking piece of work, is the fact that it is set largely in the Nazi occupied Europe during the war – with the added interest of a few chapters set in the USA, London, and Israel. This represents an interesting mirror image of the artist himself, the author, who has worked and travelled in more countries than most of us have had hot dinners. I call him an artist, as he is best known to date for films rather than novels, however one suspects that with several projects in the pipeline, Tony Klinger may yet end up being as well known as an author in the future, as he is a producer-director. Just about every write-up I’ve ever seen on Tony refers to his father, Michael Klinger. As Google is now such a powerful tool, I’ll resist telling you about the great Michael Klinger and Tony’s previous film works, and focus on this great book. For all its war-torn overtones, The Butterfly Boy’s real magnetism lies in the complex relationships that exist between the principal characters. The fractious relationship between father and son being one of the central themes. It’s a story of a Jewish boy and his dad, the boy ultimately turning into an adult and father, with strikingly similar relationship problems his father had. Then there’s the mother, the wife that never was, and the marriage of convenience that turned into a loving relationship – only to be ended tragically when a Lancaster bomber with a spare payload visited the family home in Germany one day. And I’ve not even mentioned that the main character Arnie had polio, was bullied terribly at school, and somehow found the courage and strength to become an internationally renowned artist. There are bits that I’d love to tell you, but then some of the most incredible revelations of The Butterfly Boy are best saved for reading the book and experiencing the shock yourselves when you are hit full in the face by the proverbial steam train. At least three times the book shocks the reader into submission: ‘I didn’t see that one coming’. It’s far better to experience those shocks yourself, rather than have them reported second hand. 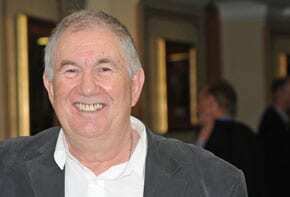 Primarily a film-maker to date, Tony has written the book as he knows best; for the screen. 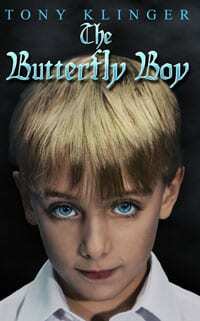 The Butterfly Boy was first visualised as a screenplay, substantially written before he even put pen to paper on the novel. Hence, armed with that knowledge you can easily view each chapter as a prospective scene from a film. One particular scene at the Swiss-German border would be the ‘highlight’ of any future film, a cinematographical highlight in this sense meaning an absolute low in terms of what can be inflicted on people, and illustrating what lengths people will go to in the strive for self-preservance (and more importantly the preservance of family and friends). The Butterfly Boy offers tremendous highs and lows, an insight into what it might have really been like to live through the worst event humankind has ever endured, some incredible twists, and most of all, a reminder that families and human relationships in general can be tough and seemingly uncontrollable. Despite people apparently wanting the same things, and saying so, often fate and circumstances means that the result is often a somewhat different outcome to any that had been planned. The Butterfly Boy has more than adequate smattering of adult action for 50 Shades fans, however this apparent throbbing normality running through the book is chronically at odds with what is going on all around the characters – pointing towards the fact that however bad things get, human life still goes on. If you want flowers and butterflies, there are a few. But what The Butterfly Boy really represents is one boy’s struggle with life in general, set amidst a backdrop of the holocaust. And for anyone who has ever struggled with anything in life, there should in The Butterfly Boy be something there for you that you can both admire and learn from. The book engages with one of our greatest human fears of all – reaching the autumn of our lives and suffering regret in our final hours, convincing ourselves that we could have, should have, done things differently, better. Fortunately, at this level, there is a so-called happy ending to the final chapter, which – whilst set in the universally sad surroundings of a funeral – provides an ultimately uplifting conclusion to what is often a challenging, harrowing, and chaotic story. And so it should be; it starts in Nuremberg in 1935, and ends in the Jewish Cemetery in Frankfurt in 1986. Firstly let me thank JQ for the wonderful review of my first novel. Somehow it seems so much more personal than the excellent reactions to my first book, Twilight of the Gods, about my making the film The Kids are Alright with The Who. I also truly appreciate Liat Nagar’s comment above. Both pertinent and accurate it does serve to explain what I was trying to do with the cover very well indeed. I can go a little further by informing readers that the other parts of the underlying narrative I wanted to signpost is that you shouldn’t judge a book by its cover. My grandson is the archetypical Aryan looking boy despite being the son of a Jewish mother, and like my lead character, Arnie, of a Gentile father. Most of us, if not all, can sometimes be subject to jumping to conclusions based on visual clues that can be entirely misleading or false. There is no such thing as ‘a complete work of fiction’, in that whatever the writer brings to the work by way of the imagination is still informed by what we know and have experienced in life, albeit as an underlay not necessarily observable in the narrative. One cannot work from a vacuum. Conversely, biographies and histories (non-fiction) are also affected by the writer’s subjectivity and experience, no matter how careful and thorough research might be. What’s important at the end is that the writing has become an art form – novel, short story, biography et al – and that’s achieved by the creative process taking over from personal deliberations. Same for the artwork on the cover. The photograph of the author’s grandson on the cover works beautifully: note the blue of his eyes enhancing the blue of the book title and the lowering of his head that allows the title prime focus in viewing. It’s a lovely cover in its own artistic right and it’s possible that no other less personal professional illustration would have hit the spot in quite the same way. If it didn’t work in this way, then it would have been better not to use a photograph of Archie. One should always be careful not to search too much for the personal in regard to the author in their written work. The novel produced should be respected entirely for how it works as a written story, rather than personal and/or historical facts pertaining to it. I don’t mean to give the reviewer of ‘The Butterfly Boy’ a hard time – not at all – just wish to discuss the professional requisites of writing well, and give the author his due in that regard.